For this month's "Maps Of The Month" featurette, I wish to draw your attention to Zerker's Jazz Jackrabbit (PC) maps. The mid-1990s were an interesting time for PC gamers. Shareware was a way of distributing games (essentially, free demos, legally allowed to be copied and shared, in an age before the Internet), CD-ROM technology was emerging, and PC gaming started to take on more cues from game consoles, including gamepads without joysticks, and the platforming genre as a whole. And for 1990s gaming in general, regardless of the market or platform, anthropomorphic animal characters seemed to be popular. Jazz Jackrabbit is at the center of all that. Jazz Jackrabbit was distributed as shareware, soon republished with more content as "Jazz Jackrabbit CD" on CD-ROM, advertised within the game itself that the Gravis PC GamePad was the official controller of the game (and popular enough at the time to almost be considered standard for PCs), and at the time, there weren't many big-name platforming games for PCs (though certainly Apogee Software/id Software's output, including the Commander Keen series, made its mark before Epic MegaGames's Jazz Jackrabbit). And this was indeed big, kickstarting the career of Cliffy Bleszinski, the force behind Unreal and Gears Of War. Even if Jazz Jackrabbit may not have been as big as Sega's Sonic The Hedgehog, he certainly was, for a short time, the mascot for Epic MegaGames, and made a cameo appearance in another of their games, One Must Fall 2097 (another "must-play" from that era). An interesting thing to note is that since these map rips go well beyond the normally playable area, there are some interesting features in those outlying areas. An interesting thing to point out - though also a warning - is there are some features that spell out some words, even some rude and crude statements. In particular, see (or beware of) the Guardian areas, since those are boss stages that don't take up much room, and hence have a large canvas for developers to play around to test things - or just to be testy. Zerker's included all of this in these Jazz Jackrabbit maps, as well as the special "Holiday Hare" episodes - this is the complete Jazz Jackrabbit package! 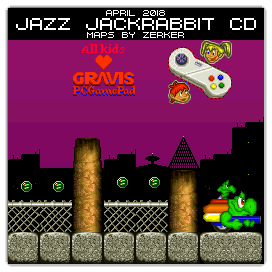 So the recognize the effort put into mapping this '90s PC icon, Zerker's Jazz Jackrabbit CD (PC) maps will be known as VGMaps.com's Maps Of The Month for April 2018. I did not know about this game, very good that you chose Jazz Jackrabbit as maps of April. Interesting to note on objects, taken from Sonic's game: springs, item box monitor and final signpost.